8 for packed powder groomers...most speeds up below warp nine. The Metal is not just a fatter version of the Masterblaster, but a completely different animal which behaves a bit different than J’s description (not just in our opinion, but some other ski review sources as well). We found The Metal is a balanced, playful, fun-loving twin tip given a more calm, settled feel than a similar designs without the Titanal strip down the middle of the core. The relatively soft, rockered tip and tail make The Metal easy to slarve into turns and happy to soak up terrain features, while a somewhat firmer midsection gives you the ability to carve it into packed surfaces if you get it up on edge and set it into the snow. The shorter effective edge feel makes The Metal behave like a shorter ski, so ordering a size larger than you normally would makes a lot of sense. The Metal is more playful and loose than strong and solid like more mainstream hard-charging, big mountain skis, but its fun factor is very high and its quiet behavior makes it suitable to cruise at most speeds below warp nine unless there are chunky debris fields under the surface which can get The Metal to get deflected a little on its trajectory. Surfy mischief is The Metal’s forte, and any park + pipe addict looking to venture out into non-park terrain anywhere on or off-piste will find this 106mm-waisted ski a great tool, especially when there is fresh snow to play with. It’s super agile and changes direction with centered pivots, smears or edged carves on demand, which will make it a fun ride in the trees when it’s a powder day. High speed boilerplate or hardpack arcs reveal The Metal can break loose at the front or rear if you’re not centered on the midsection and get your turn shape pressured incorrectly along the trajectory, but it’s easy handling makes it easy enough to quickly correct the error and get back on-track. This is a surfy cruiser, not a GS or big-mountain charging tool, but its super easy and super fun. Skied as-is out of the box – waxing only. Good fit and finish, Subdued, stealthy “GTO” limited edition black graphic (all JSkis graphics are “limited edition”...it’s part of the marketing effort to generate some sparcity of different editions and always bringing something new and fresh to market on a frequent basis...). Softer tips and tails and a fairly stout, straightened midsection. (Some people call this a ‘hinged” flex when observed from the side under pressure). Nice peek-a-boo see-through topsheet reveals the wood core and metal layer on top of the wood so you can see what’s inside. Eastern corduroy, man-made dry packed powder, shallow powder (6 inches max), Spring-like corn and refrozen man-made hardpack boilerplate in places. The Metal can be secure on hardpack, but prefers to be “in snow” rather than “on snow”. We might describe The Metal as being more happy on Western packed surfaces than Eastern...essentially if the surface is quiet underfoot, The Metal is a decent gripper. If it’s a classic Eastern boilerplate surface that makes a lot of noise as you cut across it, the Metal has grip underfoot when tipped on-edge and pressured deliberately, but can break loose at the tip or tail if you get yourself off-center and put too much faith in the tip or tail. It’s not slippery, but behaves like a rockered twin tip designed for surfy fun, not etching GS-trenches across bowling-alley surfaces. Vibration control is pretty good, canceling out buzz and annoying action underfoot. If you want a grip underfoot, a quick stomp gets the stronger midbody to bite and change direction without protest, so you always have bite if you want it. The Metal is a carnival funhouse in mixed surface types, especially cut-up fresh snow, spring-like corny conditions and bumpy terrain, letting its compliant tip draw the body of the ski into the stronger midsection where you can set your direction across your arc and finish off the easy-to-ride tail with little or no effort. You can drive or ride The Metal through mixed surfaces as you like, and not burn all your calories in the process, which makes it a fun ski. 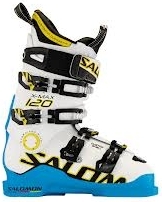 Jason has designed this ski to pop in and out of terrain with a surfy, easy feel, yet deliver a stable platform underfoot when pressured through variable surface types. The soft tip can get knocked around a little if the surface is chunky or hidden garbage under the surface deflects the forebody, but its compliant nature means you can bring it back into line with a quick correction and not feel like you’ve been dragged off your line by some force of evil with no mercy. The softer the snow or deeper the surface depth, the more The Metal shines. It loves to be “in” snow rather than “on” snow. The fun factor of The Metal in mixed terrain is a big feature. The only reservation is the slightly unsettled feeling or flap when you get up to ticket-pulling speeds through chop, but this is somewhat normal with soft twin tips more focused on delivering fun than speed records through crusty crud and junkyard snowfields. We didn’t get a chance to take The Metals into serious bumps since it was too early in the season to find snow deep enough to support big bump formation, but we did get into bumps a little less than knee-high, both tightly spaced and widely spaced, and these skis absorbed the bumps really well with a smooth, gradual feel and excellent pop underfoot when you pressed into the trough and rebounded over the bumps, or pounded the faces with the midbody. The nicely tapered design of the tip and tail eliminated any hooking or hangups. The Metals can flow through bumps like water and have the agility to change direction at any time in undulating terrain. You won’t fight The Metals in bumps, you ride them. A loose, fun, nearly goofy big dog with the ability to track like a hound on edge if it finds the scent it wants. Harpoon Take Five Session IPA: Vibrant, fun tropical frontside with pine notes and malty backbone. Like the Masterblaster, maybe make a version with a flat tail to get it to really rail at the end of hardpack turns. Maybe try a version with full-width metal sheet or extra triax fiberglass or flax to give the shaping geometry some stout foundation. The Masterblaster is a playfully loose freestyle-bred twin with carving chops if the snow is grippy. Consider a slightly longer length than you might normally order since the rocker and soft forebody will make it feel shorter than it measures. People who want a surfy, 105+ underfoot platform delivering more fun than hard work in softer conditions. Explorers off the groomed trails who want to get mischievous. Note rocker difference tip and tail. JSkis "The Metal" showing Titanal band on top of the core with tapering width as it approaces the tail. Metal at the tip is similar. JSkis "The Metal" narrow (thin) vertical profile. This image is taken just in front of the binding toepiece where the rocker begins. Note the thickness of the ski.